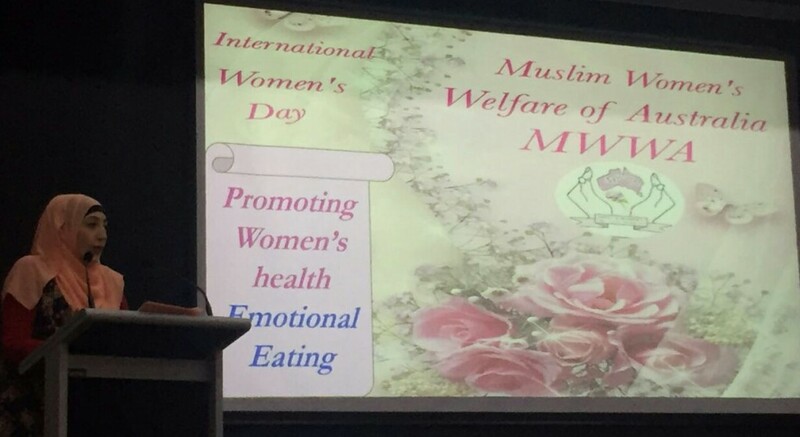 As with all international women’s days, on the 16th March 2016, the Muslim Women’s Welfare of Australia (MWWA) held a special seminar for women in the community to raise awareness about a very important and prevalent health and fitness issues. In our days, emotional (comfort) eating seems to dominate the lives of many people due to stress and depression experienced by most. A new research revealed that 83% of Australians continue to comfort eat, and an alarming figure of 63% of Australians are statistically overweight. What is more alarming to MWWA, is that 1 in every 3 women is drawn in by the vicious cycle of comfort eating. The event started with a soothing recitation of some verses of the Holy Qur’an by Sarah Kahil, a year 12 Student from Al-Amanah College in Liverpool. 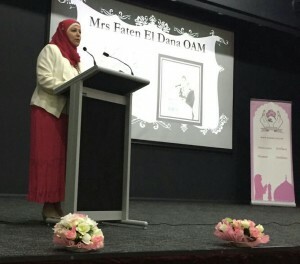 This was followed by the President of MWWA, Mrs. Faten El Dana OAM who addressed the audience with a very insightful religious perspective about healthy eating and the benefits of reducing food intake, and about observing what we eat as mentioned in the Qur’an and according to the teachings of our beloved prophet Mohammad, peace and blessings be upon him. 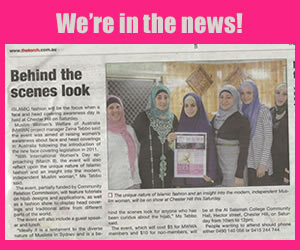 To ensure that the seminar is informative and beneficial, MWWA engaged experts in the field of dieting and exercise. 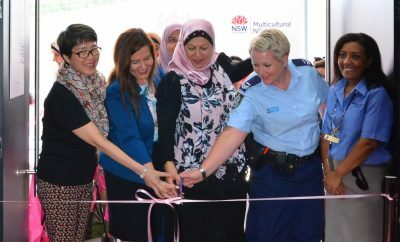 Miss Rebecca Luong, an accredited practicing Dietitian in Lidcombe, addressed the women about triggers and preventions of emotional eating, and Miss Sophie Naboulsi, an experienced Personal Trainer at Knockout Fitness in Auburn, addressed the women about the importance of exercising to our fitness. Miss Luong began her informative and well researched presentation about emotional eating by defining comfort eating, and spoke about prevention and consequences of emotional eating and explained how we can identify it. She also stressed the need to stop ourselves from eating if we are feeling bored or emotional but not actually feeling hungry. Additionally, Rebecca provided the women with examples of healthy eating patterns that they should adopt in their daily lives based on their age. Miss Luong kept the audience interested and actively involved throughout her presentation in identifying their own instances of emotional eating. She also displayed dietary charts of various food items and showed the women how to identify the contents and the various energy levels of each food item before they purchase it. 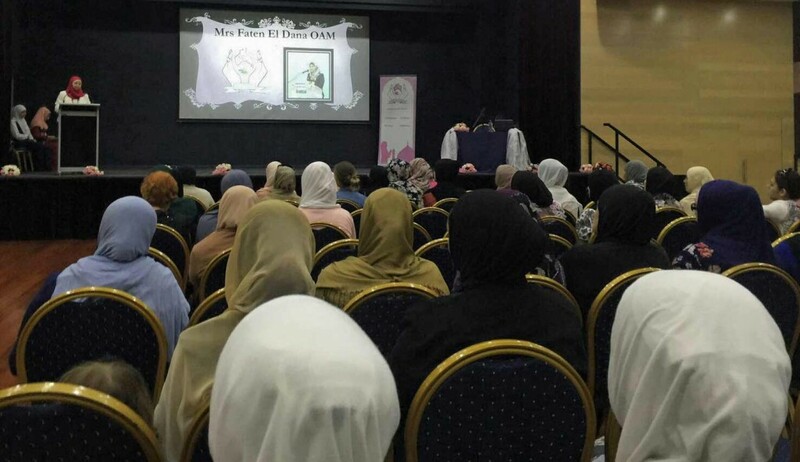 To ensure that all the women who attended benefited from Miss Luong’s presentation, Mrs. El Dana consecutively interpreted all the information given and made it very easy for all the audience to understand especially after women from Arabic speaking background were encouraged to ask questions and received the answers in the Arabic language. The questions mainly focused on food intake, diabetes, defeating emotional eating, and specific food related questions were also raised. The other segment of the seminar was presented by Sophie Naboulsi who began her talk by asking everyone to stand up and performed a heart racing activity to allow all the women to assess their own fitness level. The women embraced the activities with open arms as they had just heard from Rebecca, the Dietitian, about the importance of managing energy intake and physical activity. Activities such as star jumps, lunges and stretches were all introduced and tried by most women. Some women were clearly fitter than others but most needed to seriously consider adopting a fitness routine in their daily lives to avoid living with diseases such as hypertension, diabetes, high cholesterol, osteoporosis, etc. Sophie spoke to women about the invaluable benefit of doing exercises for at least 30 minutes per day and emphasized that any person has the potential to do some type of physical activity at their own pace and intensity level and in their own homes and still reap the fitness benefit but they need to pursue it consistently. As the seminar came to a close, the women were invited for a light lunch where they met each other and extended their circle of friends. They mingled amongst themselves exchanging ideas and opinions about the seminar and expressing their appreciation for the deep insight on these important topics of health and fitness. The closing activity of the seminar was a small questionnaire that the audience had to answer to test their knowledge of both presentations and to learn about their perspective of such crucial issues of health and fitness. Many expressed their appreciation and requested more beneficial and informative seminars in the future. MWWA would like to thank Rebecca and Sophie for their time and effort and everyone else involved behind the scene. 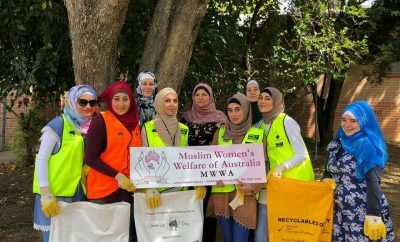 MWWA would also like to thank everyone in the audience and hope to hold more beneficial and necessary information sessions to ensure that women in the community are being informed and trained to what is useful and helpful for them and their families.